Ustrasana : Vydya Health - Find Providers, Products. 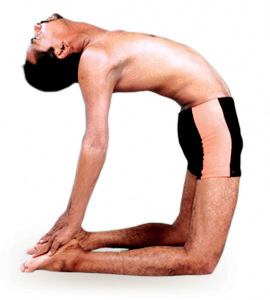 This asana gives strength like a camel which can sustain odd climates and also it resembles a camel, hence it is called Ustrasana. Make sufficient distance between the knees and toes. Turn the chin towards the left shoulder and look at the left hand fingers. Place the left palm on the left heel, pushing the buttocks forward and bend backwards. Then turn the chin to the right shoulder and place the right hand palm on the right heel. Stay in that posture comfortably, and slowly come back to Vajrasana. It prevents hunch back, frozen shoulders. It gives strength to the pelvic region. This is the best posture for ladies to overcome all the reproductive problems. It also helps pregnant women.